TIM SMITH HAS a nickname, "Big Country." On Sunday morning, Big Country came up big time for two big country stars. Saturday night at the Adams County Fair, the Brothers Osborne played a concert and wowed a large crowd. They are a big deal right now in country music. One of the brothers uses a Swirly Gig on his microphone stand, so they have to be cool. Anyway, the brothers and the band were on their way out of town after the show when their bus broke down just outside of Quincy. The frantic manager started making calls because the two brothers had a huge gig in Nashville at 2 p.m. Sunday - they were opening for Little Big Town at the Ryman. Kind of a big deal, right? Another bus was dispatched to pick them up but was still more than five hours away. The manager even called the Quincy Police Department at about 4 a.m. and asked if QPD had any ideas. Then Sgt. Adam Yates showed up to start his day shift and heard the brothers were in trouble. One brother to another - "We are in the Pepper Spray plane!" 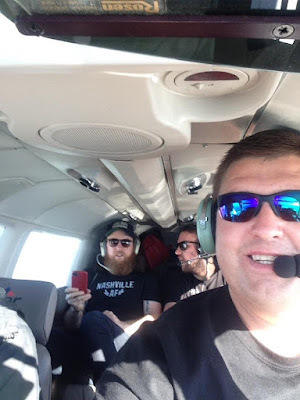 So Adam called the manager, and suggested the manager contact Tim, who has ownership in a small plane. I'd like to say the manager told Adam, "Don't you guys play in a band called Pepper Spray?" He didn't. But we can still say he did. The plane happened to be available, Tim happened to be available, and before 8 a.m. the Brothers Osborne were on their way to Nashville. Tim dropped them off and made it home by noon. Life in the Big Country fast lane, I'd say. Tim got some photos and I'm sure he has some stories. Now Pepper Spray is opening for the brothers the rest of the summer. Not. But we can still say it's true. Big Country saves big country, which was highlighted by Little Big Town country. HUGE!